Does Planet Nine Really Exist? Planet Nine is a hypothetical major planet of our Solar System whose existence has been conjectured during the recent years as a possible explanation for the aligment observed in the orbits of a group of trans-neptunian asteroids. In their 2016 paper, Konstantin Batygin and Michael E. Brown analyze the motion of 6 trans-Neptunian objects (90377 Sedna (2003 VB12), 2012 VP113, 2013 RF98, 2004 VN112, 2007 TG422, 2010 GB174) with the objective to understand the cause of their unusual orbit alignment. Orbits of the 6 trans-Neptunian objects studied by Batygin and Brown, and the hypothetical orbit of Planet Nine that could explain the observed orbits clustering. Source: Caltech. The six objects have all been discovered as part of reciprocally independent surveys, which also made use of different instruments. This leads to exclude that the observed alignment could be simply generated by artificial selection (i.e. surveys targeted to identify specific classes of objects with given similarities). Furthermore, Batygin and Brown estimated the probability that the observed clustering could be generated by chance, and discovered that such a probability is 0.007% or lower, strongly supporting a dynamical origin of the alignment. Their numerical simulation confirmed that the most likely cause of the aligment could be a massive planet (approximatively 10 times the Earth) orbiting an eccentrical orbit, with aphelion pointing in the opposite direction of the six objects' aphelion. 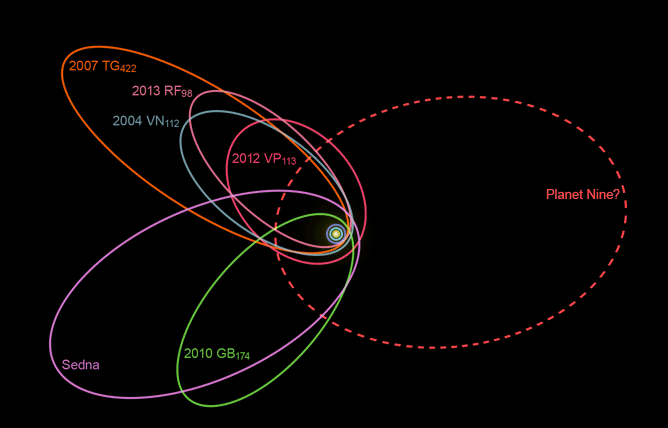 Though the evidence from the work of Batygin and Brown seems pretty strong, as for now (May 2016), no one really knows if Planet Nine exists or not. And until we will discover it through visual obrervation, its existence won't be scientifically confirmed. Many Solar System scientists are currently studying mathematical models and running numerical computations in order to further constrain possible orbits of Planet Nine, based on the grvitational influences it could have on other Solar System objects. The hope is to come to a reasonably precise prediction of Planet Nine orbit, which could guide an observational survey aimed to visually detect it. If we will discover Planet Nine that way, it won't be the first discovery of this type in the history of astronomy. Neptune's existence was postulated before its actual visual discovery, as a possible explanation of perturbations observed in Uranus' motion. French matematician and celestial mechanics expert Urbain Le Verrier was able to calculate Neptune's orbit based on irregularities of Uranus' motion, and predicted the actual position of Neptune without prior visual evidence of it. Neptune was finally found by astronomer Johann Galle the night of September 23rd 1846 at the position predicted by Le Verrier. As for now (May 2016), no onw really knows, although the studies done so far provide an approximate idea about its motion in the sky and its brightness. 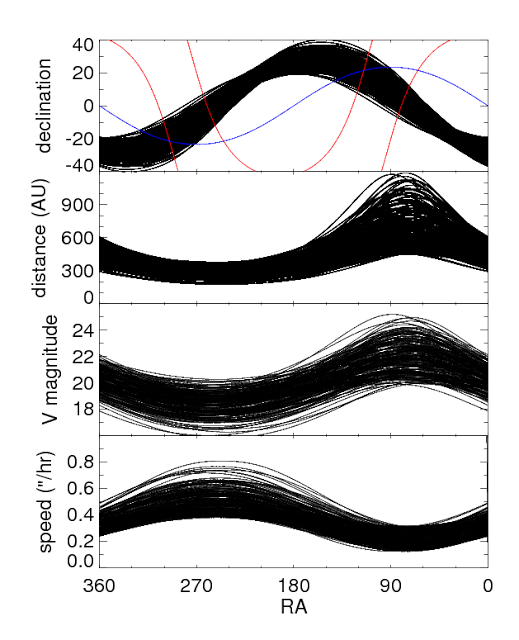 These charts generated by Batygin and Brown show the possible position, distance, magnitude and apparent motion speed of Planet Nine. Source: findplanetnine.com. By excluding areas of the sky already monitored by automatic surveys like Pan STARRS and WISE, the most reasonable conclusion is that Planet Nine could be close to its orbital aphelion, at a distance of 600-900 UA from the Sun, having a visual magnitude betweem 20 and 24, and, unfortunately, in a visual direction oriented towards the center of our Milky Way. If this approximate prediction is true, it could be extremely complicated to discover Planet Nine in front of the incredibly dense star fields close to the center of our galaxy. It is estimated that Planet Nine could be a rock and ice giant, having a radius between 13,000 and 26,000 kilometers (approx. 2 to 4 times the radius of the Earth) and a mass of 6×1025 kg (i.e. 10 times the Earht's mass. Its apparent visual magnitude should be approx. 22-24.